Through “eazypay”, a module of ICICI Bank, you can pay School fees of your ward studying in LSA, on-line i.e. by Net Banking or Debit/Credit Cards conveniently from anywhere you wish to. However, please note that School Fees cannot be deposited in Cash whether at the School or at any Bank Branch / RTGS (although the standardised “eazypay” module of the Bank may show Cash and RTGS options in their webpage). All that you need to ensure is that your latest Mobile Number is updated in ** marked field on PUPIL’S REFERENCE SHEET (Section 2) available in ACADEMIC PLANNER and your child’s Admission No. is ready with you. 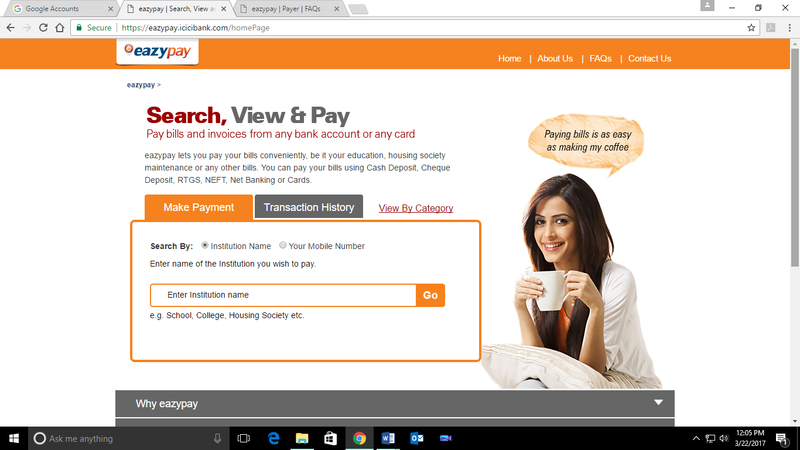 eazypay module link can be accessed from link tab in this school website or from the website https://eazypay.icicibank.com. This will be a single point of entry for you to initiate all the payments to the billers through eazypay module. Enter your mobile no as entered in PUPIL’S REFERENCE SECTION and Admission number (including ‘/’ slashes. e.g. 121/18) in respective fields. A six digit one time password (OTP) will be sent on your entered mobile number. Please enter OTP on the current screen to validate the registered mobile number. Click on submit on the current screen. Fee Details of the entered student will be displayed on screen. Check the box of terms and conditions and click on pay now. Receipt can be printed from display after payment or can be sent to you in your mail after entering your e-mail id. Click on the link mentioned to pay online i.e. net banking, debit card, credit card. For online payment through alert message smartphone with internet connectivity is required. Payment can be made following the steps mentioned for eazypay payment steps from eazypay site. This on-line payment facility will be available every quarter only during the notified normal due period of that quarter when no late fine is applicable.